Moons are everywhere in our solar system — we have one, Mars has two, Jupiter and Saturn have dozens each — but we’ve never known whether moons are as common, or even exist at all, outside our Sun’s orbit. On Wednesday, Columbia University researchers announced that they’d found the first evidence of an “exomoon” — a moon orbiting a planet beyond Earth’s solar system. The discovery of the exomoon began with a survey of 284 transiting planets — meaning they pass between a star and an instrument we use to observe space (in this case NASA’s Kepler space telescope). 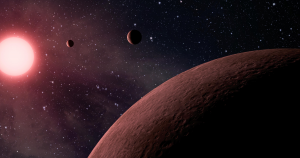 A planet passing in front of a star causes a noticeable dip in the star’s brightness, which astronomers can analyze to deduce information about a planet, such as its size and composition. In the case of Kepler-1625b, a Jupiter-sized planet about 4,000 lightyears from Earth, the Kepler survey data was a little different than the typical exoplanet, suggesting that it may have a moon. The Columbia team then used the more-powerful Hubble telescope to study Kepler-1625b, looking for any additional dimming that would confirm the exomoon, or any sign that it was affecting the planet’s gravity. They found both. Despite that evidence, the researchers caution that their work is preliminary, and it will need confirmed by future studies. And as of this week, though, it’s safe to say that many fresh pairs of eyes will set their sights on Kepler-1625b. More on exomoons: Do Exomoons Exist?